ARI D NORMAN STERLING SILVER DESK CLOCK & FRAME. 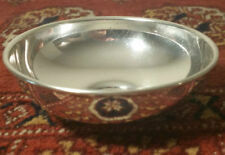 This is a very attractive looking pierced English sterling silver bowl or bon-bon dish in a good useful size. It has been assayed centrally in London during 1976 as pictured. Quality Little Sterling Silver Napkin Holder / Clip Fully Hallmarked London 2000.. Made From Sterling Silver Fully Hallmarked London 2000 With The Makers Marks 'CCP' In a Shell Shape with Ornate Detailing ... It Has a Clip Mechanism which when The Band Is Slid At The Top Forms a Clip To Hold The Napkin & Has a Hook Pin At The Top For Attachment........See Photographs Measures Approx 5.3cms (2 1/8") Long x 1.9cms (3/4") at the Widest Point & It Weighs Approx 9.1gs (0.320 ozs) In Good Condition ...The Clip & Hook Are Both Secure & Fit Tight......See Photographs Quality Sterling Silver Napkin Clip. 925 Heart Decoration WINE CUP. Condition is used. Hallmark at cup as show ,with heart shape decorated all outside up, gold over silver inside cup. In fair good condition. They are not new have been handled, enjoyed and will have age appropriate use wear. The collection is fully complete and includes 100 miniature solid silver ingots. each ingot has a different motor car on one side and the cars badge on the other side. each ingot is also fully marked 925 and dated 75. 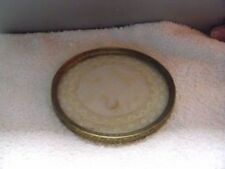 CFL Canadian Schenley award silverware serving dish. Circa 1950-1960. Canadian football league Canadian Schenley award. Given to Vern DeGeer sports editor of the Montreal Gazette. By William Devonport with the assay marks for. 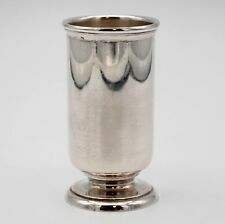 A fine Edwardian antique embossed silver Beaker Vase. Birmingham 1903. Cromwells Antique Centre is open. I tem number:- 4093 - 014. In good condition. A FINE ANTIQUE BURMESE SILVER (TESTED) CREAM JUG - 158 GRAMS. Cromwells Antique Centre is open. Item number:- 1409 - 014. Solid Silver Tudor Heraldic Fastener From Old Collection Stunning Item Found In Kent no hallmarks Un Researched Heraldic markings. A superb antique late Victorian period cased solid silver Christening set, comprising fork and spoon. Both are fully and clearly hallmarked for London 1872 with Makers initials RM/EH (Richard Martin & Ebenezer Hall - Martin, Hall & Co). A lovely early example of Irish silver for the discerning collector. Cromwells Antique Centre is open. Item number:- 7492 - 014. STERLING SILVER FLARED MOUTH SHOT GLASS IN ORIGINAL AS FOUND USED CONDITION. THIS RARE TIFFANY SHOT GLASS WILL MAKE AN EXCELLENT ADDITION TO ANY COLLECTION. THERE ARE NO MONOGRAMS ON THE SHOT GLASS AND ONLY A FEW MINOR NICKS ON THE RIM FROM AGE AND USE. A fine antique Indian silver (tested. 925) ornate Casket. which dates from circa 1890. Cromwells Antique Centre is open from. Item number:- 2214 - 014. In fine condition. This antique silver goblet, though humorous, is very finely engraved with great detailing. The makers' marks are clear and crisp and show that the goblet was made in London by renowned silversmith Stephen Smith. Each one is stamped '925' and the tray is Birmingham stamped and also has the Silver Scales Import Stamp. 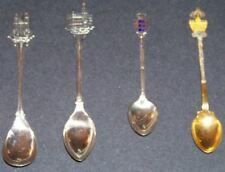 Teaspoons with the assay marks for Birmingham 1930. Cromwells Antique Centre is open. A fine quality antique set of six George V silver. Item number:- 2411 - 014. 1 Antique Rare Solid Silver Hallmarked Irish Georgian Small Sugar Tongs Heron Crest Solid Irish Silver. Also featuring an engraved Heron Irish coat of arms. Attributed to the historic Irish Heron family. A fine quality George V antique silver Comport with the silver assay marks for Birmingham 1936. Cromwells Antique Centre is open. A lovely example of English silver that would enhance any setting. Item number:- 1933 - 014. Primary Material： Tibet Silver. Type： Tea Pot. It is in good condition, no crack and no chip. you can see the shape is very well. So wonderful item. A fine antique French Silver Bread Basket which. dates from circa 1890. Cromwells Antique Centre is open. Item number:- 3225 - 014. I have for sale a stunning whistle in the Georgian manner. This whistle is in the shape of a flint lock gun. The whistle is hallmarked 'sterling'. The gun has stunning embossed detail. A fine Edwardian pair of antique silver Walker & Hall Bon Bon Dishes. with the assay marks for Sheffield 1904. Cromwells Antique Centre is open. Item number:- 1324 - 014. In good condition with just a small split as photographed. A fine pair of Victorian antique silver Pepperettes. with the assay marks for Birmingham 1892. Cromwells Antique Centre is open from. I tem number:- 3926 - 014. dings to the base as photographed. Vibrant design of leaping ram, hallmarked GCS 830 ( continental Silver ). Wallace Meadow Rose Knives, Butter Spreader, Forks, Spoons, Servers, Etc. (47 Pcs) 1123 grams. THIS RARE COLLECTION OF INDIAN HEAD SPOONS WILL MAKE AN EXCELLENT ADDITION TO ANY COLLECTION. THE TOTAL SILVER WEIGHT IS 32 GRAMS FOR ALL FOUR SPOONS. Ninety Three Year old British Threepence Coin from 1919. 1919 Three Pence Coin. Before decimalisation brought about a new currency with new coinage, the sum of three pence was pronounced variously /ˈθrʊpəns/throop-ence, /ˈθrɛpəns/threpp-ence or /ˈθrʌpəns/thrupp-ence, reflecting different pronunciations in the various regions and nations of Great Britain. Ninety Five Year old British Threepence Coin from 1917. 1917 Three Pence Coin. Starting at its monetary value one Penny.With No Reserve. Solid 0.925 Silver. In Good Condition given it is almost one hundred years old. Marked 226. This is a RARE find. Total Weight: 5.1 oz. We have over 30 years of experience in jewelry. particularly during peak periods. and are not to be used by anyone else. A FANTASTIC INDIAN MADRAS SOLID SILVER BOWL HIGHLY DECORATED WITH SWAMI DANCING LADIES AN AUTHENTIC VICTORIAN PIECE 1890 LATE RAJ PERIOD UNMARKED TESTED SILVER STANDING 4.25" TALL WIEGHES 124g IN VERY GOOD CONDITION FOR AGE WOODEN STAND NOT INCLUDED. The assay marks for London 1990. Cromwells Antique Centre is open. I tem number:- 3986 - 014. The weight of the elephant is 1062 grams, I think that it is made of resin with a silver coating. Approx 7.5"(18cm) high x 8"(20cm) long. Seven Sterling and 2 Coin Silver. Various makers, types and sizes. Total weight is 8.42 Troy Oz. Marked 430. Estate Find. Total Weight: 4.2 oz. particularly during peak periods. and are not to be used by anyone else. WEIGHS 7.4 Ounces OF. 925 STERLING SILVER. particularly during peak periods. BABY MY BAPTISML SHELL SPOON. ANGEL BOY ORNATE IN STERLING SILVER 925. that both of us will be happy with. " 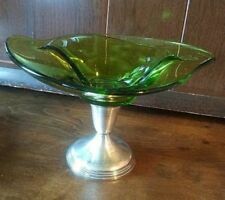 COLLECTIBLE, AND DECORATIVE ". Weight : 34 Gram´s. One of the ice cream forks is engraved to the bowl Easter 1915. Condition: The ice cream forks have been engraved to the back of each and one to the bowl part. Silver ice cream forks weigh approx 130g.